A special meeting of two of Brazil's most influential artists, vocalist Joyce and guitarist Dori Caymmi has been appearing in the Bay Area throughout the months of May and June. As a jazz singer and composer, Joyce is a sophisticated chanteuse bred in Rio's fertile jazz/samba scene whose sound mellifluously combines Brazilian rhythms, jazz harmonies and intelligent lyrics. Joyce has written over 300 songs, most of them performed by such great stars as Milton Nascimento, Elis Regina,Gal Costa, Maria Bethania, Flora Purim, Wallace Roney, Jon Lucien, Jon Hendricks, Gerry Mulligan and many others. shadings and vocals with some of the best players in the world. He is acknowledged for his musical prowess that stems from the paternal guidance he received as the son of Dorival Caymmi, one of the foremost composers in Brazil. Caymmi has received international acclaim and awards for his work as a composer and as an arranger. Today, Caymmi speaks his musical language in several different styles ranging from World, Fusion, Bossa Nova, Latin Jazz and Brazilian Jazz. 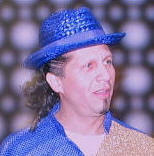 Bobby Wallace has long been standing tall promoting the power of Carnaval as a sublime culmination of rhythm and dance. An accomplished musician and founding director of the Beat Dance Center in Berkeley he is now taking commitment to the next level. His persistence and passion has evolved a unique workout system which combines the percussion and dance moves into the most compelling body workout you can experience. "Rhythm is anything that repeats itself. It's a natural life force that has existed for thousands of years and will continue to exist for thousands of years after we're gone." This completely original system can be seen on a website video at totalrhythm.com. The Carnaval spirit compels Bobby to share these rhythms. A key part of the fun system is connecting to the force of rhythms whose mysterious joyful power informs all life on its deepest levels. This enigmatic life force has remained outside of the understanding of science and is communicated to the people by their artists. As we move forward here at the edge of the earth with a world on the brink self-destruction, Robert will launch an important DVD as he attempts to get the world to join his total rhythm posse and synch with these rhythms of joy and ancient mystery. The 10 Most Popular World Rhythms You can Play on Any Drum"! All proceeds go to Sistas_Wit_Style Dance	Programs. A Non- profit organization. To place order call 510 952 6287, 510 635 2828, 510 387 7771 or email us @ [email protected] . Orders can be placed as early as Wed May 9, 2007. There will be a 3 order minimum for delivery or you pick up. When placing orders please provide name, phone number, location and preferred time of delivery. Friday, May 11 party at Alberto's! Mission Neighborhood Centers at the Cinco de Mayo Festival sfcincodemayo.com -- celebrating the rich, cultural diversity of San Francisco, and commemorating the City of San Francisco's own Mexican roots. Get to the park early (10am) and take advantage of free, docent-led tours of Mission Dolores. You can pick up tour passes at the Festival information booth. On March 31st Mestre Carlos Aceituno will be honored as a recipient of the Chavez Family Vision "Si Se Puede" Award. 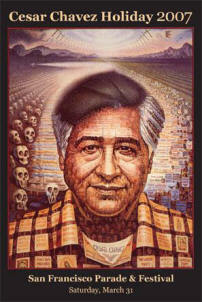 This award is only fitting for a man that embodies the core values of Cesar Chavez and lived them in everyday life. The organizers have asked Fogo Na Roupa Bateria/Dancers and Omolu Capoeira be present in full regalia with drums to take part in the historical march. Fogolistas--To March wearing red and white!!!! S. Market St. and Park Ave.
7th annual Bay Area Cesar Chávez Holiday Parade and Festival. GETTING THERE: Ride Bart to SF 24th Street (Walk east to Potrero). Or ride Muni lines 9, 33, and 48 to the start of the parade. After 14 years of leadership, Jose Carrasco has stepped down as the Executive Director of Loco Bloco, one of the core contingents of Carnaval San Francisco. Saying that it was time to move on and let a new generation of leaders take over, Jose announced his resignation. At a recent Carnaval Advisory Committee meeting, Jose introduced Alejandra (“Aleks”) Zavaleta, who is the new Executive Director of Loco Bloco. Alejandra was a teen participant at Loco Bloco in the 90s. She went on to join the Loco Bloco staff as an Americorps worker through the Robert F. Kennedy Fellowship Program. Following that she worked as the Children’s Services Coordinator for Mission Neighborhood Centers, Inc.
Mission Neighborhood Centers/Carnaval San Francisco wish to acknowledge Jose for his many creative and innovative contributions to Carnaval San Francisco and his dedication and advocacy for youth in the community. For more information on Loco Bloco go to www.locobloco.org. 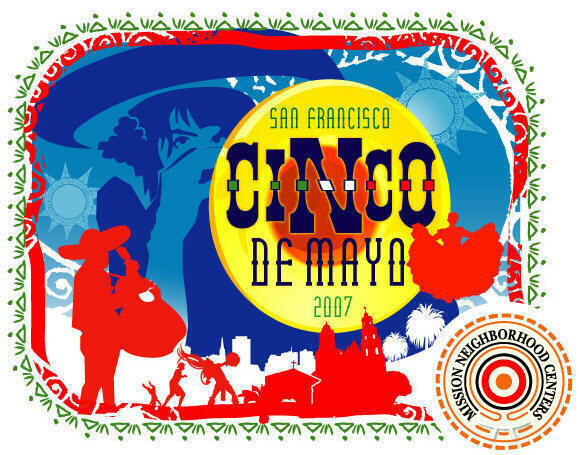 Mark your calendar for the gala celebration sponsored by Mission Neighborhood Centers/Carnaval San Francisco, INFINITO, Mission Merchants Association and El Mensajero on Thursday, December 21, 2006 at 7:00 pm at Brava Theater, 2781 24th Street, San Francisco. Food, good cheer, door prizes, gift bags, Infinito screening, book signings and music! Free admission. Information regarding Memorial Services RIP: Carnaval San Francisco's great Carlos Aceituno passed on September on Tuesday September 26, 2006. Leave Yerba Buena Gardens at noon and will shimmy, shake and samba its way up Powell Street to Union Square. New for this, the 2nd year will be a 100+ contingent from the SFUSD schools. Adults: $10; Youth: $5; under six: free. San Francisco 94122. 9:30 pm. [/B]Degustación de Aguardiente Cristal y Ron Viejo de Caldas. DJ Colombiano con lo mejor de la salsa, merengue, vallenato y el "Birimbiri" abosao que estaremos presentando en el Carnaval de SF. Featuring: Michelle Martin & Konpayi, Portsha Jefferson and Rara Tou Limen, Loco Bloco featuring: Belleza Bateria & Men's Dance Ensemble), & Las Que Son Son. The award winning San Francisco Hispanic Chamber of Commerce (SFHCC) is honored to host the April Business Mixer to celebrate the Ibero-American Consulates. Join us in celebrating representatives from Brazil , Chile , Colombia , Costa Rica , Ecuador , El Salvador , Guatemala , Honduras , Mexico , Nicaragua , Peru , Portugal , Spain , and Venezuela. Sistas-Wit -Style Caribbean Folk Performing Co. presents All You Can Eat Crab Feed on Friday, April 27th, 2007. The crab feed starts at 6:30pm and ends at 8:30pm at the Lakeside Gardens Hall on 666 Bellevue Ave. Oakland, off Grand Ave. (next to Fairyland). *dance lessons, floorshow & drum jams & dance rodas! bring your best beats & moves! see you there! TRANSCEND!!! Friday April 6th "El Charangero Mayor en Vivo" DANNY LOZADA @ JELLY'S Pier 50 THIS FRIDAY!! 295 Terry Francois Blvd behind SBC Park San Francisco 94158 _________________________ also music provided by: DJ WaltDigz Doors open at 9pm. Show starts @ 10:30pm ID REQUIRED. No dress code!! General Admission $20 This show could SELL OUT!! 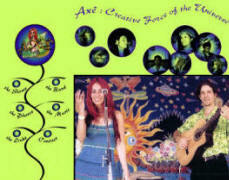 Come party with this exciting new band and experience pure Brasilian energia! 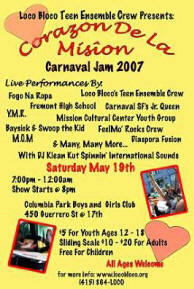 Special Guest Appearances by: 2007 Carnaval SF King Macarrao Portugal and former Carnaval SF Kings and Queens. eastsideartsalliance.com This the Official Malcolm X Jazz Festival After Party!!!! Friday May 18, 10:00 p.m. to 1:00 a.m.
Stephen and Colleen Tiffenson, the directors of the Carnaval's oldest Carnival band ---Mas Makers Massive--- returned from their annual pilgrimage to Trinidad Carnival with a great catch. Two of the most respected and honored names in the history of TnT music will be headlining the event. "We play, not for money, but to celebrate happiness. Our carnival is a street carnival. It is for everyone, not just for those with money." The SF Jazz fest brings us the King of Bahia Carnaval on a double-bill celebration of music’s universality. These two acts from opposite side of the Atlantic, Brazil’s Carlinhos Brown and Barcelona’s Ojos de Brujo, share one thing in common: a masterful ability to seamlessly mesh their homegrown music with a far-reaching palette of global influences. Carlinhos Brown chose his stage surname in honor of the late James “Godfather of Soul” Brown and Black Panther H. Rap Brown. The choice says much about the multitalented Brazilian’s ethos—an infectious mix of heavy funk and social awareness. His skill as a songwriter drew attention from legendary Brazilian artists Caetano Veloso and Sergio Mendes, whose Grammy-winning 1985 album Brasilero featured five of Brown’s compositions. It also was the recorded debut of Vai Quem Vem, a group of young percussionists from Brown’s hometown of Salvador, Bahia. Brown’s passion for his hometown, a rich source for Brazilian music, led to the foundation of Timbalada, which is both a wildly popular band and a neighborhood association that aids street children. Brown remains active in every corner of Brazilian music: as a solo performer; with Marisa Monte and Arnaldo Antunes in Tribalistas; as a songwriter and sought-after producer; and as a thrilling live performer. Timbalada founder plus reggae legend Toots and local fav SambaDa. ZEITGEIST INTERNATIONAL FILM FESTIVAL overcookedcinema.com/ Show dates are June 11, July 9 and August 13, 2007. These will be three different programs.